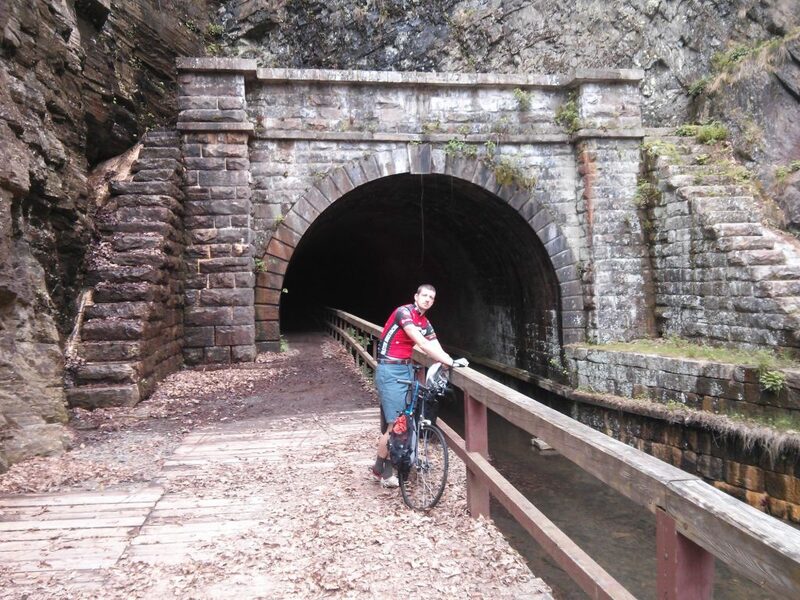 While living in Pittsburgh for two years, I explored a good portion of the Great Allegheny Passage (GAP) which connects downtown Pittsburgh, PA with Cumberland, MD. 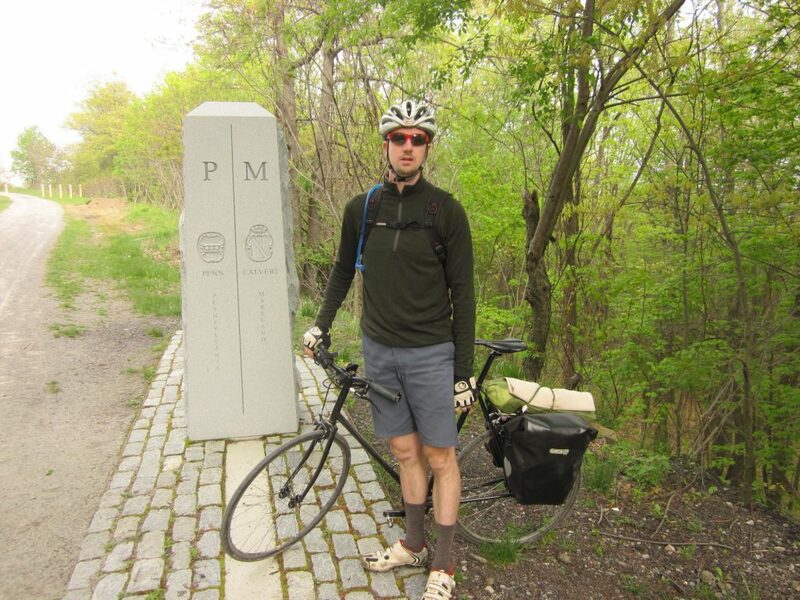 I met several people who rode all the way to Cumberland and then took the C & O Tow Path Trail to Washington DC. I never got the chance to ride the entire way but I knew I wanted to do it one day. After a lot of route planning, gear testing, and practice trips Seth and I were confident about doing the trip over six 60 mile days. We planned to camp three nights and then stay in hotels/BnB’s the other three. We flew into Pittsburgh airport with our bikes and assembled them in the waiting area. Seth had scouted a trail on Google Earth that connects the airport with the Montour Trail, which is basically a loop around rural Pittsburgh starting/ending in downtown Pittsburgh. We rode clock-wise into downtown. Once in downtown we hit a few quick tourist spots: riding up/down the Monongahela Incline, checking out some Shepard Fairey work on the Southside, and riding across the Smithfield bridge. I wanted to “officially” start our trip on the north side of the Smithfield bridge because that’s where Lenz started his round-the-world trip in 1892, 122 years and 1 week earlier. We would be roughly following his route to DC. We then hit the trail and started making a good pace. We stopped to explore the old boarded-up roundhouse in McKeesport. 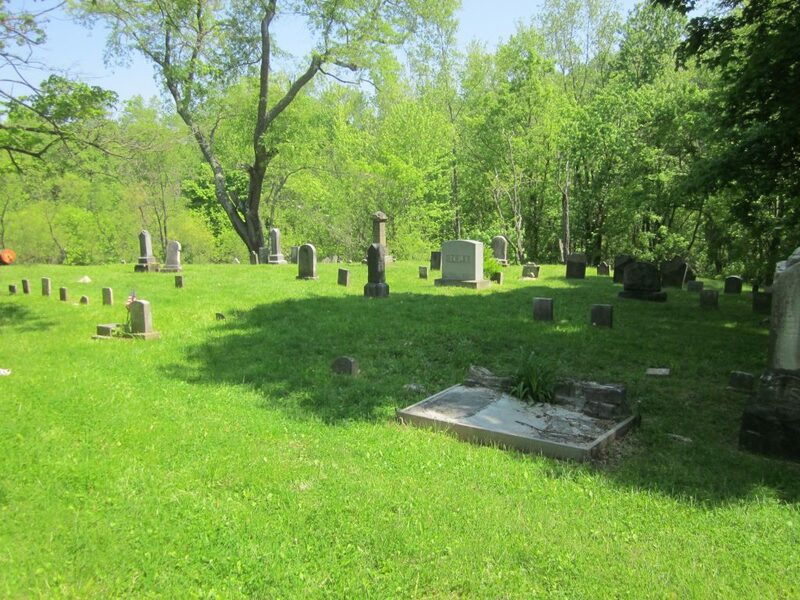 The first night we made it to Dravo Cemetery after dark. We setup tents and cooked a quick meal. It was a few degrees below freezing that night. One of the many things I packed was my MacBook Pro. While in my tent that night I was able to get a quick hour of work done. It felt really good to be able to work out in the middle of nowhere. We got up the next morning and rode into Ohiopyle. Our plan was to detour off the trail and visit FallingWater. Unfortunately we got a late start to the day and the detour would have added another 15 miles to our day. The GAP is a rails-to-trails conversion so it is basically flat. Getting up to Falling Water would have added a lot of climbing that Seth and I weren’t looking forward to so we skipped visiting Falling Water. We made it into Ohiopyle at dusk and stopped at the convenient store there. We bought so much food you’d think we hadn’t eaten in a month. We made it to Confluence campground after dark and setup tents again. After making a well earned meal, we cleaned up in the campground bathrooms. They don’t have showers there but a bird bath in the sink was good enough. 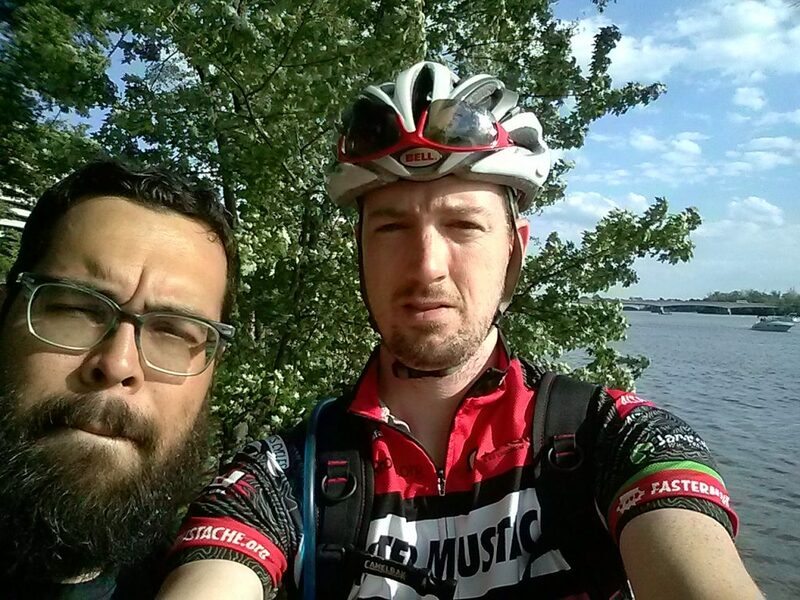 We ditched all of our gear and rode into Confluence. The entire town is closed by 6pm so come prepared. There is nothing to eat/buy if you miss out. I remember this from my time living in Pittsburgh so we made sure to load up in Ohiopyle. In the morning we rode back into Confluence and ate at Sister’s Cafe. I had forgotten how good a $5 “all american” breakfast could be. We started riding again after breakfast. I had ridden all of the trail up to this point before when I lived in Pittsburgh. From now on, I would be as new to the trail as Seth. We were stopped pretty early on by a downed tree that we had to crawl through and pretty much drag our bikes through the dirt. By mid-afternoon we had made it to the eastern continental divide. The Big Savage Tunnel acts as the “gateway” to the Chesapeake watershed. It’s so long that the temperature drop on the inside is 10 – 15 degrees. We had to stop, jacket up, and turn on our lights. One of the most stunning views of the trip (and probably of my life) was waiting for us on the other side. 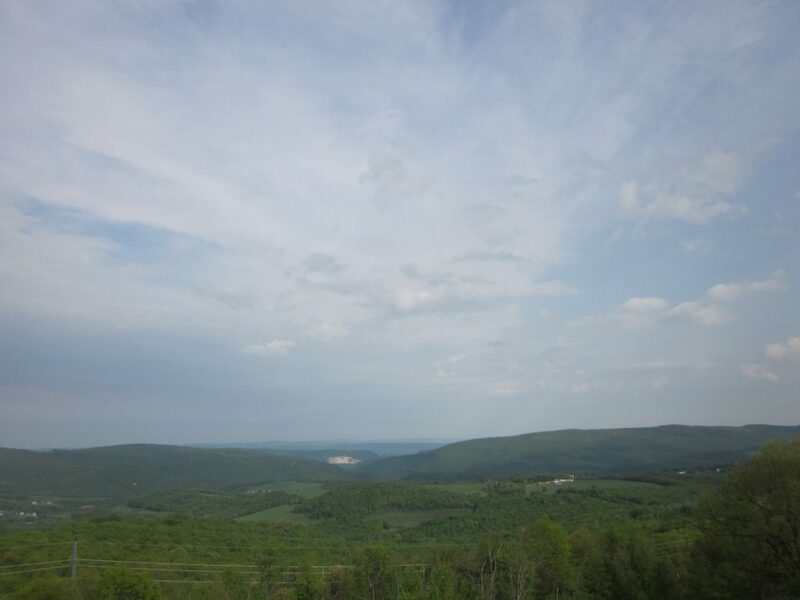 After enjoying the view for at least 30 minutes, we blazed down the only real downhill into Cumberland Maryland, passing the Mason Dixon line on the way. In Cumberland, we stayed at the The Bruce House Inn. The host was incredibly kind and inviting. She sees a lot of cyclists passing by. There was a couple staying in another room who was doing an out-and-back from Pittsburgh. The house features an attached garage where we were allowed to keep our bikes. I can’t recommend this place enough for cycling adventures or really any trip to Cumberland. On day four we started the C & O Tow Path trail. I had heard some negative things about this trail, especially compared to the GAP. The GAP is buttery smooth packed sandstone. The C and O was, at times, rutted out and difficult to ride on. Mostly however the path surface was just bumpy. I would describe it as railroad ballast crushed into smaller ping-pong ball sized rocks, interspersed with crushed sandstone. Before we began the day, Seth decided to upgrade his wheel set. We stopped in to Cumberland Trail Connection to do some shopping. This place is perhaps the coolest bike shop I’ve ever seen. First of all they have the most helpful staff and they are stocked with pretty much every bike part/gear you could want. But to top it off, they double as a home-brewers supply shop. So you can get your brewing yeast and carbon road wheels all from the same store. I decided to buy a few more spare tubes. I was traveling with two already, but given the warnings I bought two more. We finally started the trail late in the morning and immediately hit a rain shower. We had been expecting it and quickly jumped into rain gear. Throughout the day I would end up getting four flats. It was the first hard day for me. In retrospect I misjudged my bike setup. I had all of my pack weight on the back wheel. I was also running on 25 mm tires. They had been perfect on the GAP but under these bumpy conditions, it was too much. After my fourth flat, I realized that my next flat would require pulling out the patch kit. I really started to milk it in the afternoon. I was riding very slowly; Seth was getting really far ahead of me. However, day four held for me the most important part of the trip. After seeing the few pictures of Lenz from his trip, I really wanted to make it to the Paw Paw tunnel. It was eerie walking our bikes through the tunnel. It felt like we were in a thousand-year-old catacombs. The boardwalk on the other side was pretty nasty and I ended up with another flat. We knew of a side-shoot trail called Western Maryland Rail Trail (WMRT) that ran parallel to the C & O through Hancock, MD. We had been told that it was paved and in much better shape than the C & O. Luckily I made it to the trail head without any more trouble. Once we were on the WMRT we were again making good time. After riding in the rain for part of the day, we decided to skip camping that night, as originally planned. Seth found a little motel in Hancock. It was nice to have a hot shower after a tough slow day. In the morning we stopped by C & O Bicycle and I swapped out tires. The largest tires that would fit on my bike were 32 mm. Once I had those mounted we were off again. We made excellent time and I felt really confident on the larger tires. Once we started the C & O, the scenery really changed from the GAP. Day five was probably the most idyllic day of scenery. We had a constant view of the Potomac and the filled-in swamp-like canal. All of the locks on the tow path are inactive, but not all have been destroyed. 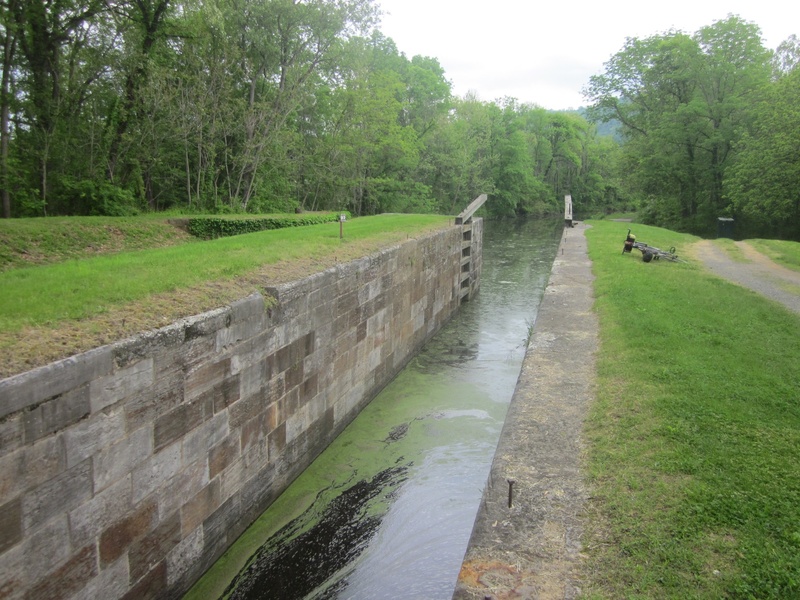 It was really impressive when we encountered one of the locks in good shape. I can’t imagine these were built by hand 180 years ago. 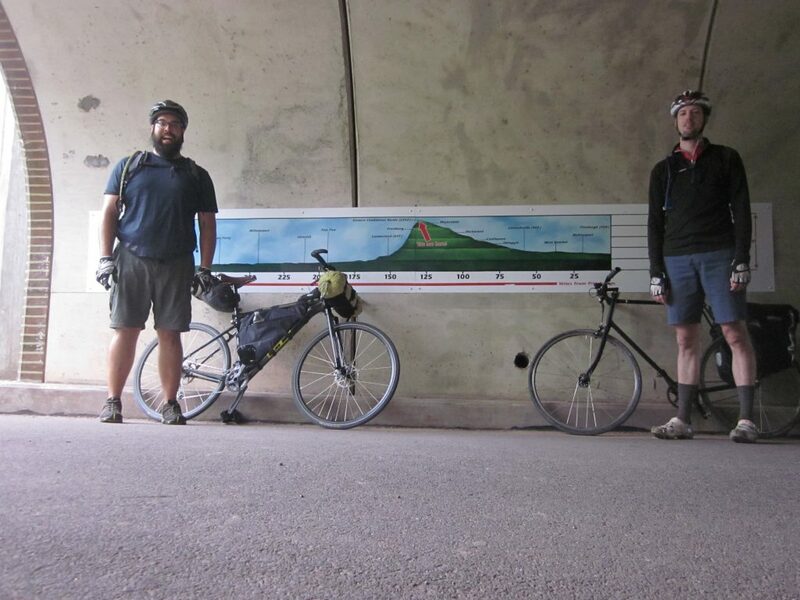 Day five ended with Seth and I rolling into Harper’s Ferry, MD. I really have to say this was one of the few mistakes of the trip. The bridge over the Potomac from the trail to Harper’s Ferry is not at all bike friendly. We had to strip all of the gear off our bikes and carry everything up two flights of stairs. Because Harper’s Ferry is also a through-stop for the Appalachian Trail, the “main” hostel fills up really quickly. We had to stay at a second hostel, The Teahorse BnB, two miles from the historic “center”. This hostel was total sketch-balls. Our “room” ended up being two beds behind a blue tarp, setup in the common area. The showers were upstairs, accessible only by an exterior stair. Needless to say we were quite ready to leave in the morning. Once we were back on the path we rode into Brunswick. This is the town we should have stayed in if we knew what we know now. There is a bike shop in town and perhaps the best breakfast along the whole route. We had coffee and pastries at Railroaders Coffee and Tea and then bought sandwiches for the road. I think we were both burned out by the start of day six. We had already ridden 300 + miles. 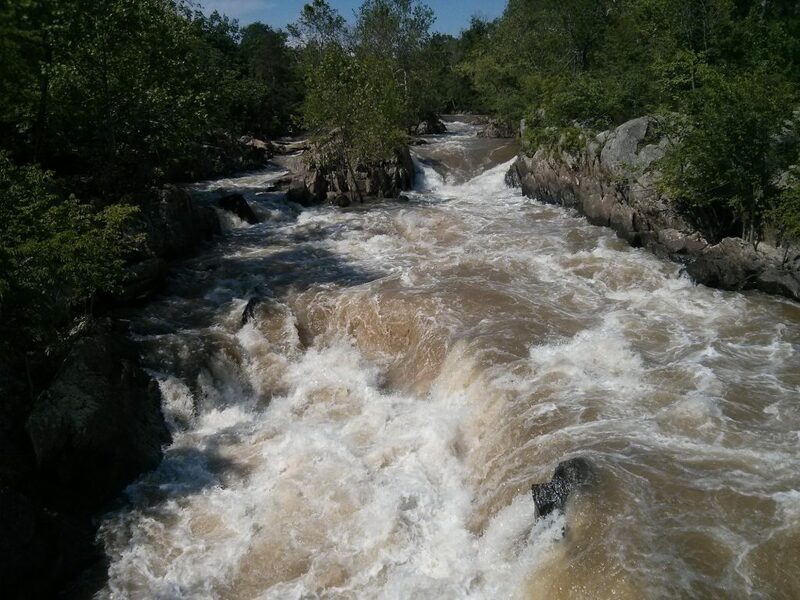 We did get to see the rapids of the Potomac as it approached the coast, but we were ready for a day off. Riding into Georgetown was beautiful but the trail was packed with joggers and day-trippers. The going was much slower that we wanted. Finally we made it all the way to mile marker zero where the canal enters/exits the Potomac. We then rode back up the C & O to where it joins the Capital Crescent trail to Rock Creek Trestle. Our plan was to stay with friends who lived in the area. All told, we rode 380+ miles in six days, camped two nights, and ate and drank ten billion calories. The trip was a great start to bike touring. However, we would do a few things differently next time. I think we should have committed to camping every night or staying in a hotel every night. We ended up camping only the first two nights, then carried camping equipment for another four days for no good reason. Also, I would have started the trip on wider 32 mm tires, instead of pushing it on 25 mm tires. I think we did a good job of breaking the route down into manageable days. Five days would have been too much riding, and seven days would have just dragged on and gotten boring. I’m also glad we rode west to east. DC was a more beautiful “welcoming” city to finish in. Since the Pittsburgh suburbs stretch so far, the last 2 hours riding into Pittsburgh would have felt like forever. I also think we did a good job flying into the airport with bikes. Initially I was nervous that our bikes would get lost or damaged in transit but we lucked out. I’m really impressed that I made the entire trip on my single-speed beater/commuter bike. That bike has taken me through everything, in every configuration. I can’t wait for the next trip!